The nene (Branta sandvicensis), or Hawaiian goose, was proclaimed the Official Bird of Hawai‘i on May 7, 1957, and is an endangered species. It is not known how many nene once inhabited the island chain, but by the arrival of Captain James Cook nene were found primarily in high elevation habitats. Several factors led to the rapid decline of the nene, including predation by alien species such as feral dogs, cats, rats, and the mongoose. Hunting during breeding season remained legal until 1907, and quickly diminished the wild population. By the time it was realized that nene were teetering on the brink of extinction it was estimated only 30 - 50 geese remained in the wild. 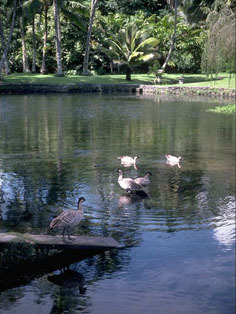 A captive propagation program was begun, and in 1949 Big Island rancher Herbert Shipman (who had maintained a small flock of captive nene since 1918) loaned two pairs to the Territory of Hawai‘i and a trio to the Wildfowl Trust in Slimbridge, England. Since 1960 more than 2,000 young have been reared and released into the wild on four islands. Nene are waterfowl and utilize water just as any other species of geese or ducks, but the nene differs physically from most other species of wild geese with a more upright stance, a turned-down nail on the tip of the bill, reduced webbing of the feet, and longer legs and wings. They range in height from 21" to 26" and weigh about 2 kilos (4 1/2 pounds). The legs and feet of nene are smoky black, and the body dark brown to dark gray with cream-tipped feathers. Buff-colored feathers form an unusual furrowed pattern along the entire length of the neck. 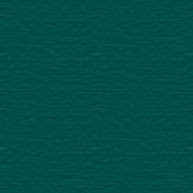 Males and females have identical plumage, and the male is typically slightly larger. 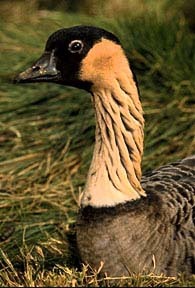 The call of a nene is a resonant "honk" similar to other species of wild geese. It is its almost constant moaning while feeding that is most unusual… a low murmuring "nay-nay" made when its bill is closed. Although nene typically establish life-long monogamous pairs, they will occasionally form trios consisting of one male and two females, and following the death of a mate the remaining nene will bond with a new partner. Some pairs have also been known to 'divorce' and choose new mates. Both sexes can reach reproductive maturity in their first year, but females usually mate at two or three years of age. 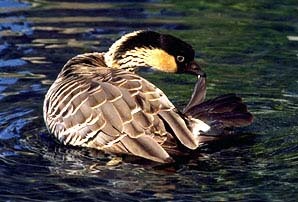 The nene is the only goose species in the Northern Hemisphere to nest during the winter months of October through March. Nests are constructed on the ground, and are excavated by their feet into shallow depressions concealed under low shrubs. Clutch size is between 3 - 5 eggs, which are 55 - 60 mm in width and 85 - 90 mm from end to end. Incubation is solely by the female and takes 28 to 30 days. Males guard the nest by perching on nearby shrubs, boulders or high ground. 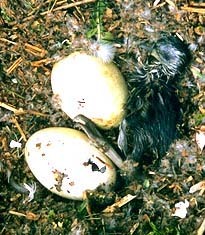 At hatching, goslings weigh between 90 - 105 grams. Nene goslings take flight, or fledge, at about 8 weeks of age. The life span of wild nene may be 35 years or more. The oldest recorded captive nene is believed to have been 42 years old at the time of its death. Nene are omnivores, eating primarily grasses, seeds, buds, flowers, leaves, fruits and berries, but will also eat fish and insects opportunistically. Nene feed mostly in the early morning and late afternoon, and rest in the shade throughout the day. Small flocks of nene will consistently roost overnight in the same location, dispersing after dawn to a daytime feeding ground, returning at dusk. Nene roosting at the W.H. Shipman estate congregate at dawn in the coastal spring-fed ponds before departing for daytime habitats. Nene are very social birds and parental care is prolonged. They may travel in family groups for the first year, usually dispersing when the parents nest again. Flocks will sometimes form after the breeding season when the new goslings have fledged. It is speculated that the species once nested in coastal habitats and migrated to seasonal food sources at various elevations after goslings fledged. 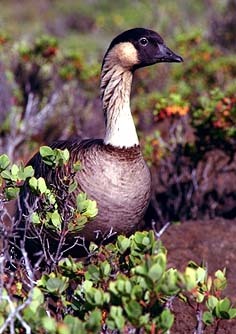 The results of a three-year gosling mortality study by Dr. Helen Baker and Dr. Paul Baker placed emphasis on the importance of a new approach for state officials to begin lowland releases and in the mid-1990s nene were freed in isolated coastal areas on Kaua‘i and on the mid-elevation slopes of the West Maui Mountains. Following the Baker's recommendations for lowland releases, the nene population more than doubled within a four year period. More recently, nene have been released at a coastal pasture on the east end of Moloka‘i. In 2010, the statewide population was estimated to be about 900 birds. Integrating the nene into todays altered lowland habitats is critical for their survival. You can help save this endangered species by keeping them wild.